THE Lahi Soccer Association is set to host its grand finals at the Sir Ignatius Kilage Stadium in Lae on Saturday. Association general secretary Tinge Emuka said teams were finalising preparations for the showdown. Papua New Guinea Football Association president John Kapi Natto is expected to officiate at the grand finals. 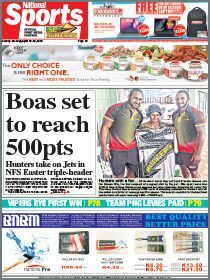 This will be Kapi Natto’s first official duty since his election as president in Port Moresby two weeks ago. Emuka told The National that the games would start at 9am, with teams urged to arrive an hour prior to their games. To start the occasion, BasicTech Sambure will lock horns with Bismark Marine Sobou in the U17 division. Last weekend, Sobou had to grind out a 2-0 victory over Lusco for a date with Sambure. In the men’s reserve division, Consort take on Sobou for the premiership. In the men’s B-league, Tiangs return from a week’s break to play Yamaki. Yamaki are not to be taken lightly, as they played their hearts out last weekend against Corals to win the major semifinal 4-1 in a penalty shootout. In the women’s division, favourites Prima Power face Morobe. Prima Power should not underestimate their opponents, who go into the match with nothing to lose. The men’ A-league clash between Consort and Sobou will round out the grand finals. Sobou, who had a bye last weekend, will go into the match refreshed. Both teams have quality players, who will be out to dominate early and set the tone for the entire match.